Pirates & Privateers : I have for a long time been looking for the exact name of a prow sculpture that had a face carved mostly in wood and was laid in front of a sailboat. Could pirates decorate their boats with such sculptures? Question of Helen (11.04.2015): I have for a long time been looking for the exact name of a prow sculpture that had a face carved mostly in wood and was laid in front of a sailboat. Could pirates decorate their boats with such sculptures? A: Pirates did not have time to carve and decorate their ships with figureheads. If they had a figurehead, it was certainly from a ship they had plundered! 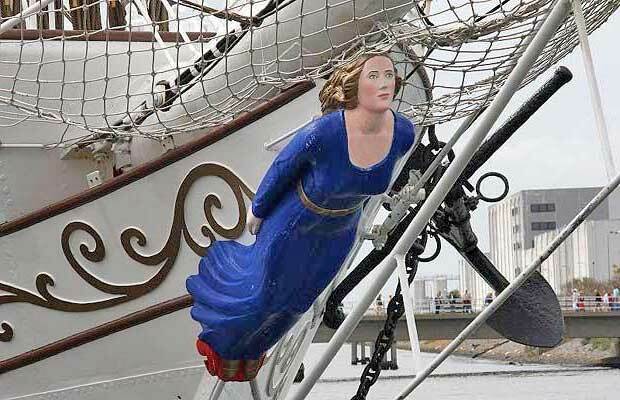 The sailors were very superstitious and almost always had a figurehead (= front) of their ship. She was the symbol of an offering to the sea to appease the gods of the sea. Figureheads were rarely male deities (such as Triton or Poseidon) or animals, but women or sirens also often featured. These female forms were a tribute to the gods of the sea. Women might also be that, and bearing misfortune they were used in the bow to scare the evil spirits of the sea. Who is the pirate who collected the most balls and injuries? Please cite the number of injuries. Were the clippers armed? How many sailors minimum were needed to maneuver one, and how many to maneuver a frigate? Congratulations on this excellent site! How much is an 18th century (brand new) galleon to build? I wonder how many men there were on a pirate ship. Thank you in advance! What is the name of the gun used by pirates in the past? » Ask a constructive and interesting question! Many netizens often ask the same question before looking for is probably this that interests you? How to become a pirate?